Feel the rush as you soar through the air for a thrilling ride on your zipline and bring your adventure to a steady stop with these new kits. The Slackers Brake Kit can be added to any Slackers Zipline, including the Eagle Series, which was awarded the 2013 Tillywig Top Fun Award and Dr. Toy's 10 Best Active 2013. Feel the rush as you soar through the air for a thrilling ride on your zipline and bring your adventure to a steady stop with these new kits. The Slackers Brake Kit can be added to any Slackers Zipline, including the Eagle Series, which was awarded the 2013 Tillywig Top Fun Award and Dr. Toy&apos;s 10 Best Active 2013. Using a trolley system, the brake kit gently slows the rider using a brake block attached to the zipline. The brake block is anchored by Slacker&apos;s exclusive bag anchor, built to hold 100 lbs of sand and created with easy installation in mind. A 15&apos; soft stop bungee cord connects the brake block and anchor, and slows the rider to a gentle stop. Appropriate for riders 8 and up. Kit Includes: Bungee Length- 15ft. Hard plastic brake block. Bag for anchor included. 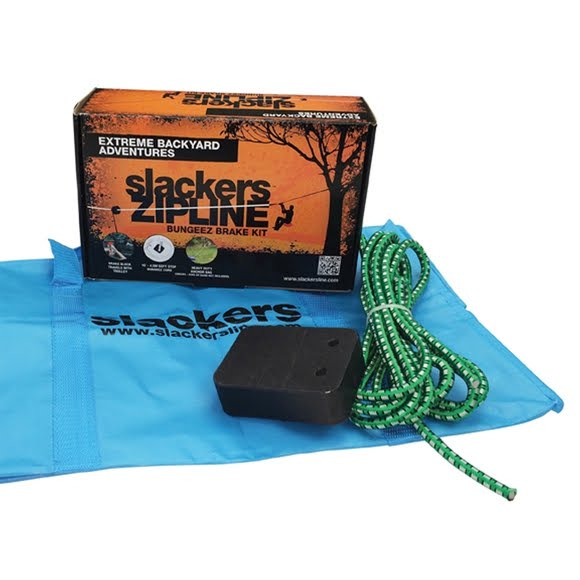 Ages 8+; Use with any Slackers Zipline Series Kit ONLY.